Kawase Roshū presented her first solo recital in autumn 2015. As a performer of Jiuta sōkyoku in the Kyūshū tradition she has consistently demonstrated her profound and outstanding ability in conformity with the classical tradition in her performances as a singer and performer of the shamisen, koto and kokyū. 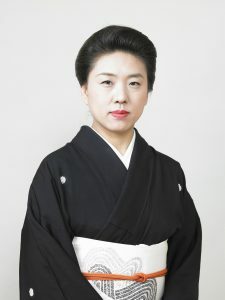 In addition to her activities as a performer she has worked as a composer and arranger in the context of a wide range of activities that include performance in the off-stage kuromisu Kabuki ensemble and instruction in shamisen, koto and kokyū (Sankyoku) performance to aspiring performers and actors. She is an artist set to play an important and wide-ranging role in the future of the Japanese traditional performing arts. Born in Kurume City in Fukuoka Prefecture in 1967, Kawase Roshū began studying koto and shamisen under the direction of Mihara Yuka at the age of seven. She joined the Hakushūkai branch of the Ikuta school of koto music at the age of fifteen and studied koto, shamisen and kokyū as the apprentice of Kawase Hakushū, head of the branch. In 1987 she performed the piece Sankyoku ito no shirabe at the National Theatre in Tokyo at a concert to commemorate the 25th anniversary of the Hakushūkai, after which she was granted the name Kobayashi Roshū. She was formally adopted as the daughter of Kawase Hakushū in 2009. In 2011 she performed Akoya at the National Theatre in Tokyo at a concert to commemorate the 50th anniversary of the Hakushūkai, after which she took the name Kawase Roshū. In 2015 she was awarded the ‘Creative Tradition Prize’ of the Japan Culture and Arts Foundation and was appointed Kurume Furusato Ambassador. In October that year she presented her first solo recital. In 2016 she performed Azuma jishi on the kokyū at a concert held at the National Theatre featuring up-and-coming performers of Japanese traditional music and dance. She is currently studying the Kyūshū tradition of Jiuta with Fujii Hirokazu. As a performer she is working nationally and internationally with musicians from the worlds of Sankyoku and dance as well as performing in Kabuki ensembles on koto, shamisen and kokyū. She is also active as an arranger and teacher. She is a trustee of the Japan Sankyoku Society and of the Ikuta School Association, instructor in the Kabuki music (Takemoto) training department at the National Theatre, and head of the Hakushūkai.